Mitochondrial acetoacetyl-CoA thiolase enzyme (also known as 2-methyl-acetoacetyl-CoA thiolase and beta-ketothiolase; abbreviated as T2) plays an essential role in isoleucine and ketone body metabolism. T2 deficiency is a rare autosomal recessive inherited metabolic disorder characterized by a normal early development followed by intermittent episodes of metabolic encephalopathy with ketoacidosis between 6 months to 2 years of age. Urinary organic acid analysis by gas chromatography-mass spectrometer (GC-MS) typically shows marked excretion of 2-methylacetoacetate, 2-methyl-3-hydroxybutyric acid and tiglylglycine, which are the intermediate metabolites in the isoleucine pathway. Here we describe a boy who presented with acute encephalopathy and metabolic ketoacidosis with a confirmed novel homozygous ACAT1 missense mutation with an atypical urinary metabolic profile. 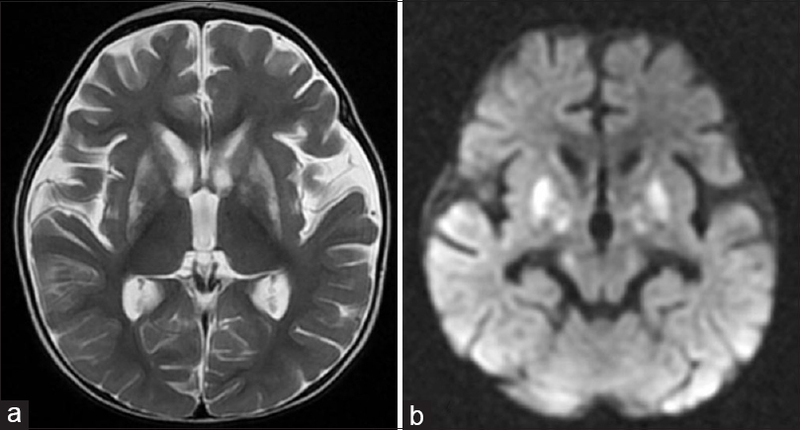 An eleven-month old boy presented with a history of regression of milestones following an episode of metabolic encephalopathy. He was born of third degree consanguinity with normal birth history except for low birth weight (2.2 kg) and had normal development until 9 months of age. At 5 months of age, he developed one episode of simple febrile seizure and recovered uneventfully. At 9 months of age, he developed fever along with multiple episodes of non-projectile vomiting and diarrhea. The next day, he developed breathlessness and became lethargic. He had an episode of seizure characterized by a brief period of uprolling of eyeballs lasting for 10 seconds. The child was intubated due to his poor respiratory effort and was kept on ventilatory support for 7 days. The parents noted that he was not making any eye contact, had lost head control and was floppy. He presented to our hospital 2 months after this event. He did not develop any further seizures or metabolic encephalopathy. The child was alert, but was floppy and had failure to thrive. His arterial blood gas analysis (ABG) on initial admission at the local hospital had shown severe metabolic acidosis (pH-7.09, PCO2-24 mm Hg, HCO3-5.5 mmol/L), hyperammonemia (192.6 mmol/L) and mildly elevated serum lactate (4.63 mmol/L). The urine was positive for ketone bodies (ketones ++). His routine hemogram, renal function and liver function tests were normal. Magnetic resonance imaging (MRI) of the brain showed symmetric T2 weighted and FLAIR hyperintensities involving bilateral caudate nuclei, putamina and globus pallidi [Figure 1]. Our initial impression based on the clinical and blood parameters was in favor of an inherited metabolic disorder related to the intermediate metabolism affecting a branched chain amino acid in the ketolytic pathway, urea cycle, or mitochondrial pathways. He was evaluated in our hospital considering the above differential diagnoses [Figure 2]. His ABG (pH-7.36, PCO2-31 mm Hg, HCO3-11.9 mmol/L) was suggestive of compensated metabolic acidosis with mildly elevated lactate (4.2 mmol/L) with resolution of ketonuria and hyperammonemia. Tandem mass spectrometry analysis of serum showed normal levels of amino acids, carnitine, and fatty acids. The urine analysis showed three times elevation of 3-methylglutaric acid and 3-methyl glutaconic acid whereas 2-methylacetoacetate, 2-methyl-3-hydroxybutyricacid and tiglylglycine were not detected. The genetic testing for 3-methylglutaconic aciduria type 1 (AUH gene), type II (TAZ), type III (OPA 3), type IV (TMEM70) and type V (DNAJC19) were negative. We proceeded with next generation sequencing for genetic defects in other organic acidurias, which revealed a homozygous missense substitution mutation c.764A>C(p. Glu255Ala, chromosome 11.108012365A>C) in exon 8 of ACAT1 gene in our patient. The child was started and maintained on a low protein, high carbohydrate (hepatic) diet and had no further episodes of encephalopathy. Mitochondrial acetoacetyl-CoA thiolase (beta-ketothiolase or T2) enzyme is involved in the isoleucine metabolism, ketone body formation in liver, and ketolysis in extrahepatic tissues. This patient had the classic presentation described in the literature with acute metabolic encephalopathy in the presence of hyperammonemia with ketoacidosis at 9 months of age. The mild elevation of 3-methyl glutaconic acid and 3-methylglutaric acid in urine was unusual since these are intermediate metabolites in the leucine pathway. Blood and urine amino acid profile by the gas chromatography–mass spectrometry(GC-MS) analysis in our patient was done 2 months after the encephalopathy episode (due to his late referral to our institute), which might have resulted in lack of detection of the typical metabolic profile in him. Since 2-methylacetoacetate is unstable and volatile, it may not be detected in the urine, whereas 2-methyl-3-hydroxybutyric acid and tiglylglycine may not be increased when the patient has mild mutations and when he/she is unstressed., Hence, the patients with T2 deficiency can be missed if the typical metabolites are analyzed under stable non-episodic conditions, which had happened in our case. Some reports of an abnormal urinary excretion of 3-methyl 3-hydroxyglutaric acid have been described in propionic acidemia and T2 deficiency. Since the first report of T2 deficiency by Daum et al., around 100 cases have been reported from many countries with only one case report from India which identified a homozygous novel c.578T>G (M193R) mutation., Numerous mutations (more than 50) have been described in the ACAT1 gene with either completely absent or with variable residual enzymatic activity., The gene locus ACAT1 is located at chromosome 11q22.3-q23.1. The mutations in T2 deficiency are heterogeneous and no common mutation has been identified so far.,, We have identified a novel homozygous missense substitution at c.764A>C (p. Glu255Ala, chromosome 11.108012365A>C) in exon 8 of ACAT1 gene in our patient. The limitation in this particular case study was that we did not obtain T2 enzyme assay from the fibroblast culture. The metabolic profile was also determined when the patient was in a stable phase and without any isoleucine challenge test. Moreover, such assays are not widely available in India, and hence, we considered mutational analysis for confirmation of the diagnosis. This case illustrates the need for the clinician to maintain a broad perspective in evaluating a child with inborn errors of metabolism. An atypical presentation warrants a meticulous genetic evaluation with clinical exome sequencing to arrive at a specific diagnosis. Fukao T, Scriver CR, Kondu N. The clinical phenotype and outcome of mitochondrial acetoacetyl-CoA thiolase deficiency (beta-ketothiolase or T2 deficiency) in 26 enzymatically proved and mutation defined patients. Mol Genet Metab 2001;72:109-14. Enns GM, Cowan, Klein O, Packman S. Chapter 32 Aminoacidemias and organic acidemias. In: Swaiman KF, Ashwal S, Ferriero DM, Schor NF, editors, Paediatric Neurology principles and practice. 5th edition. Saunders 2012:328-56. Wortmann SB, Kluijymans LA, Engelke UF, Wevers RA, Morava E. The 3-methylglutaconic acidurias: What's new? J Inherit Metab Dis 2012;35:13-22. Fukao T, Maruyama S, Ohura T, HasegawaY, Toyoshima M, Haapalainen AM, et al. Three Japanese patients with beta-ketothiolase deficiency who share a mutation, c.431A>C(H144P) in ACAT1: subtle abnormality in urinary organic acid analysis and blood acylcarnitine analysis using a tandem mass spectrometry. JIMD Rep 2012;26:107-15. Pollitt RJ. The occurrence of substituted 3-methyl-3-hydroxyglutaric acids in urine in propionic acidaemia and beta-ketothiolase deficiency. Biomed Mass Spectrom 1983;10:253-257. Daum RS, Lamm P, Mamer OA, Scriver CR. A new disorder of isoleucine catabolism. Lancet1971;2:1289-90. Akella RR, Aoyama Y, Mori C, Lingappa L, Cariappa R, Fukao T, et al. 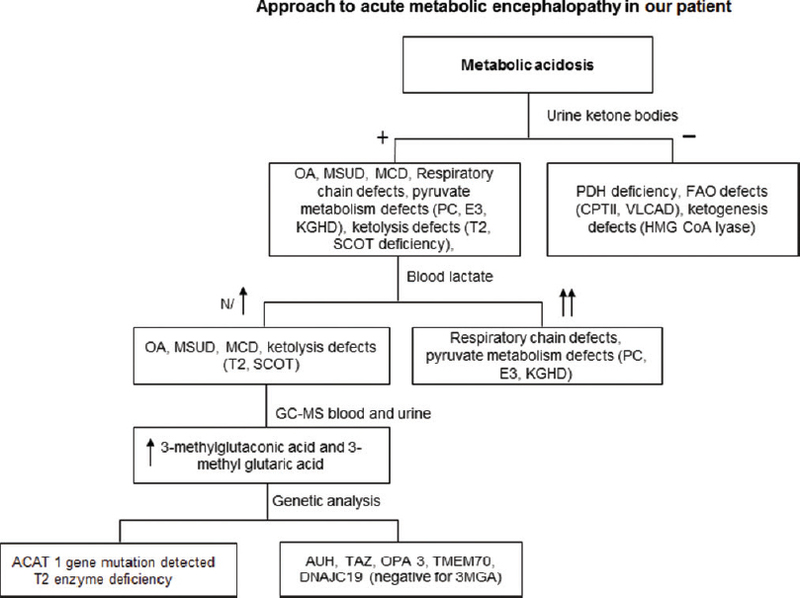 Metabolic encephalopathy in beta-ketothiolase deficiency. Brain Dev 2014;36:537-40. Fukao T, Yamaguchi S, Orii T, Schutgens RB, Osumi T, Hashimoto T. Identification of three mutant alleles of the gene for mitochondrial acetoacetyl-coenzyme A thiolase. A complete analysis of two generations of a family with 3-ketothiolase deficiency. J Clin Invest1992;89:474-79. Kano M, Fukao T, Yamaguchi S, Orii T, Osumi T, Hashimoto T. Structure and expression of the human mitochondrial acetoacetyl-CoA thiolase encoding gene. Gene 1991;109:285-90. Screiber J, Chapman KA, Summar ML, Ah Mew N, Sutton VR, MacLeod E, et al. Neurological considerations in propionic acidemia. Mol Genet Metab 2012;105:10-15.